Guyanese-born Khamraj Lall, was convicted this week on several charges ranging from cocaine distribution to money laundering. Lall was found guilty last Thursday of conspiracy to distribute cocaine, money laundering, structuring monetary instruments, and conspiracy to commit money laundering and structuring, U.S. Attorney Craig Carpenito announced yesterday. Lall, 51, of Ringwood, New Jersey, was convicted on all eight counts of a superseding indictment following an eight-day trial before U.S. District Judge Anne E. Thompson in Trenton Federal Court. According to documents filed in the case and the evidence at trial, from April 2011 through November 2014, Lall, a private pilot, smuggled hundreds of kilograms of cocaine from Guyana to New Jersey and New York on his privately owned jet aircraft and then laundered the proceeds. 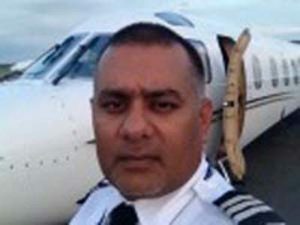 The accused, who owed a private jet charter business called Exec Jet Club in Gainesville, Florida, used the proceeds of his cocaine empire to purchase jet planes, houses, and cars. He also paid more than $2 million in cash stuffed in suitcases to a Florida contractor to build an airplane hangar in Guyana. The Government of Guyana has since taken possession of the hangar at the Cheddi Jagan International Airport at Timehri. According to the justice.gov, over a three and a half year period, Lall also made (or had others make) 1,287 cash deposits totaling approximately $7.5 million into more than 20 different bank accounts in New Jersey and New York, much of it in $20 bills. In order to avoid detection and circumvent bank reporting laws, all 1,287 deposits were for amounts less than $10,000. In November 2014, Lall was flying one of his jets from the United States to Guyana and stopped in Puerto Rico to refuel. An outbound search of the plane revealed $470,000 in cash stuffed into a suitcase hidden in the tail of the plane, and another $150,000 in cash hidden under a seat. The conspiracy to distribute cocaine carries a minimum penalty of 10 years in prison, a maximum of life in prison, and a $10 million fine. The counts for money laundering and conspiracy to launder money each carry a potential penalty of 20 years in prison. The counts of structuring and conspiracy to structure cash carry a potential penalty of 10 years in prison. US authorities had moved to seize the cash, two planes and other properties related to Lall. The investigations involved several agencies. U.S. Attorney Carpenito credited special agents and task force officers of IRS-Criminal Investigation, under the direction of Special Agent in Charge John R. Tafur; the Morristown, New Jersey, police department, under the direction of Chief Peter Demnitz; special agents and staff of U.S. Immigration and Customs Enforcement (ICE) Homeland Security Investigations (HSI) under the direction of Special Agent in Charge Brian Michael; the Drug Enforcement Administration-Rochester, New York, under the direction of Special Agent in Charge James J. Hunt; the Federal Aviation Administration, Law Enforcement Assistance Program; and U.S. Customs and Border Protection Air and Marine Operations Center under the direction of Richard T. Booth, with the investigation leading to the conviction. The government was represented by Assistant U.S. Attorneys Jonathan M. Peck and Thomas S. Kearney of the Criminal Division in Newark. In Guyana, Lall was well known with his 2014 arrest in Puerto Rico a shock. He is said to be the owner of the Kaylees gas station, East Bank Demerara. He ran a limousine service and said to have flown former President Donald Ramotar. The cases involving Lall had spanned from Puerto Rico to New York to New Jersey.